Automatic availability interface between RDP and SynXis. 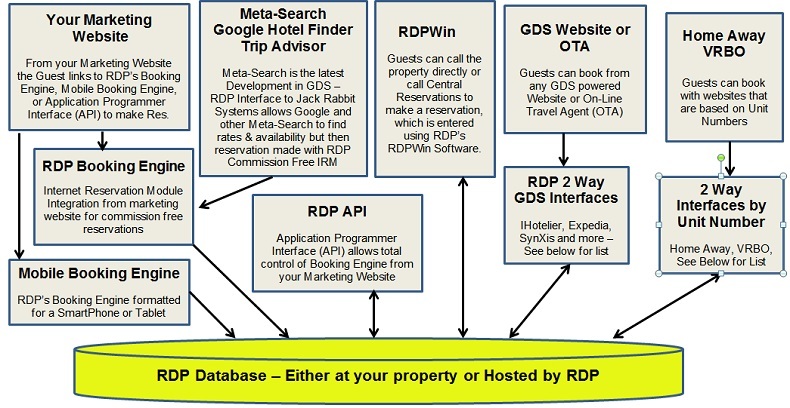 Automatic loading of reservations booked by SynXis into the RDP system. Automatic rate interface between RDP and SynXis. Distribution of your inventory to online travel agents such as: Expedia, Travelocity, Orbitz, etc. Use of their website booking engine. Distribution of your inventory to traditional travel agents. 24 hour/365 Call Center reservation agents who can make your reservations when your offices are closed. Internet Marketing and Consulting Services. Why Use the SynXis Interface? Increase revenue by having true last-room availability open to the SynXis distribution channels, or manage a SynXis room block within the RDP Software. Reduce manual data entry by having reservations loaded automatically into RDP via the SynXis system. Sign a contract with SynXis for their GDS services. SynXis charges a set up fee, monthly fee, and a per reservation fee for their services. Please contact SynXis to learn more about pricing. Purchase the SynXis interface from RDP: $5,000 plus an additional $750/year in support. See RDP Contacts. Contact your SynXis Account Manager to begin the process of interfacing with RDP.